I have a major museum commission for MASS MoCA , but before I came back to my New York Studio to begin the project, I went on a painting trip to Ireland. I began in Doolin, a small town well known for its music. Doolin is a good starting point to explore the surrounding area of the Cliffs of Moher and the Burren. I stayed at the Ballanacky Hotel just outside of town. The hotel is now run by the third generation in the family and sits atop a hill with commanding views of the Cliffs of Moher and the ocean. As guests of the hotel we were able to get a private tour of the castle keep from the owners that dates from the 1300's and sits next to the hotel. The castle was partly in ruin, but for me it was a unique opportunity to climb through and up a keep and see how it was built. We were able to visit the various rooms and floors which one would never been able to do on a public visit. There are hundreds of such castles in Ireland, most of them built on hilltops where wind and rain are powerfully felt. I tried to paint it the next morning but it started to rain and I was only able to do the under-drawing as my watercolor would just be washed away. I then went off to paint the Cliffs of Moher, but the wind was so strong it blew over my water and brushes. I was able to do a quick study. 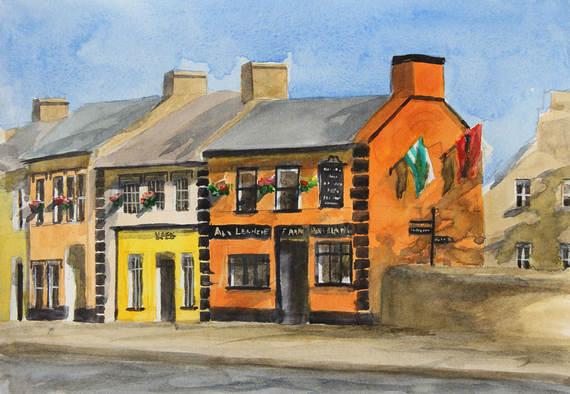 I returned to Doolin to paint the colorful buildings of the town but again was interrupted by rain - so it was back to the hotel to paint their views. Cliffs of Moher, watercolor on paper 9" x 12"
A highlight of this visit was a walk through the Burren with Shane - a local farmer - arranged by the hotel. He shared his knowledge of the wildflowers, herbal remedies, Irish history and politics on our way to a Stone Fort at the top of the Burren. The walk was breathtakingly beautiful, as were the views, and having the local connection made it special. Conversations with the owner of the Ballanacky Hotel and with Shane about Ireland made it more personal and insightful. Adare, watercolor on paper 9" x 12"
I was looking forward to returning to Dingle, which I had visited many years ago, and painting. I drove the Slea Head loop, which was breathtaking. If you are going to do any loop in Ireland, I would recommend this over the Ring of Kerry which is much longer and less scenic. I stopped to paint and again it was so windy that my only water supply was knocked over onto a stone slab table (which puddled and I was able to use to finish my painting, not quite ideal but I didn't have another choice). It is often necessary to be creative and flexible when painting outside. I had planned on taking the ferry to see the Blasket Islands, but the Irish weather does not always cooperate, so I hiked Lake Annascaul instead. Nobody was there except a few locals. It was beautiful and stormy, but well worth the hike up to the waterfall amid the barren landscape and sheep. I stayed at Emlaugh House, a beautifully appointed home with the owner's antiques and great views of Dingle Bay, so I could again retreat to paint from the inside when the storm came. It was also convenient to be able to walk to Dingle town where I could set up to paint early the next morning. I learned to play tag with the weather and always have my supplies with me. 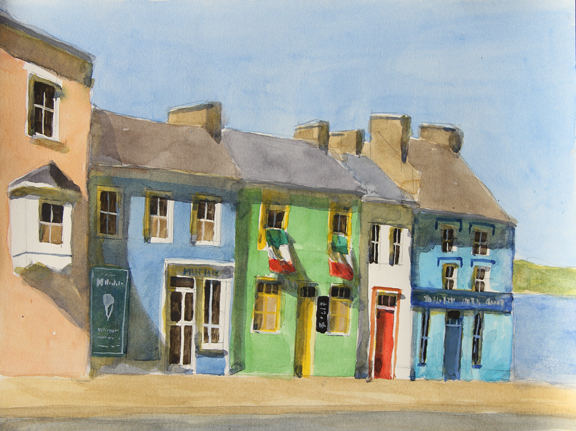 Dingle, watercolor on paper 8" x 10"
On the way to Cork, I stopped at the Blarney Castle. I didn't actually go into the Blarney Castle as the line was too long, but the estate is 60 acres and includes nature trails, gardens (a poison garden where everything is deadly), and walks - enough to keep one busy for a few hours. It is well worth the visit to see the gardens and grounds alone. I stayed at the Hayfield Manor Hotel in Cork which was nestled on a hill away from the hustle and the crowds. It is a good location to use as a base for any Blarney Castle explorations. I was on my way to the Rock of Cashel and Glendelaugh so this was a good midway stop. They serve a delicious afternoon tea and have a nice spa for those so inclined. 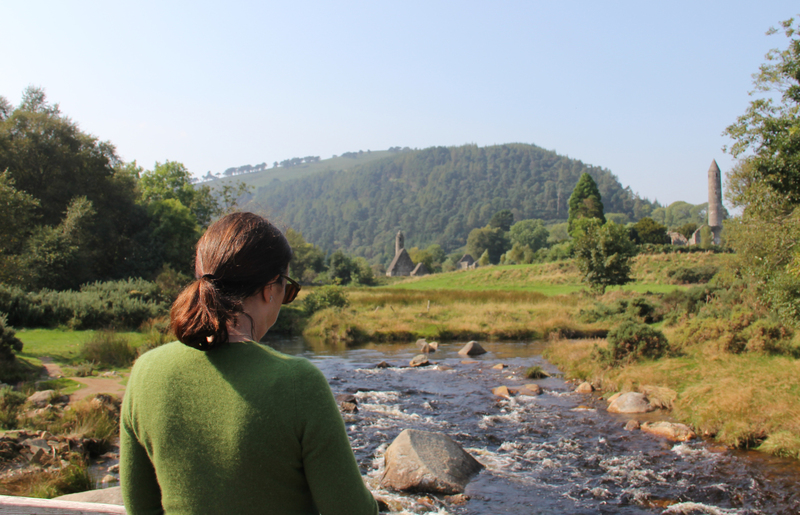 The last visits were to the Rock of Cashel and Glendalough, both of which were worth the trip. I particularly liked the tranquility of Glendalough and could easily see why the monks would have chosen this spot for a monastery. I wanted to be sure to see the National Gallery in Dublin so planned a stay at the Merrion Hotel, which was right across the street, before flying home. Unfortunately the museum is under construction but I was able to see Vermeer's A Lady Writing a Letter, with her Maid and John Singer Sargent's The Bead-stringers of Venice (I recently gave a lecture at the Metropolitan Museum for the Sargent exhibit). The Book of Kells is also a short walk, located at Trinity College Library in Dublin. The Merrion Hotel has an art collection of its own, considered one of the largest and most significant private collections of 19th and 20th century art in the country which are on exhibit throughout the public rooms in the hotel. They also serve a very elegant afternoon tea inspired by the artwork, and its location provides for a nice walk of Georgian architecture. 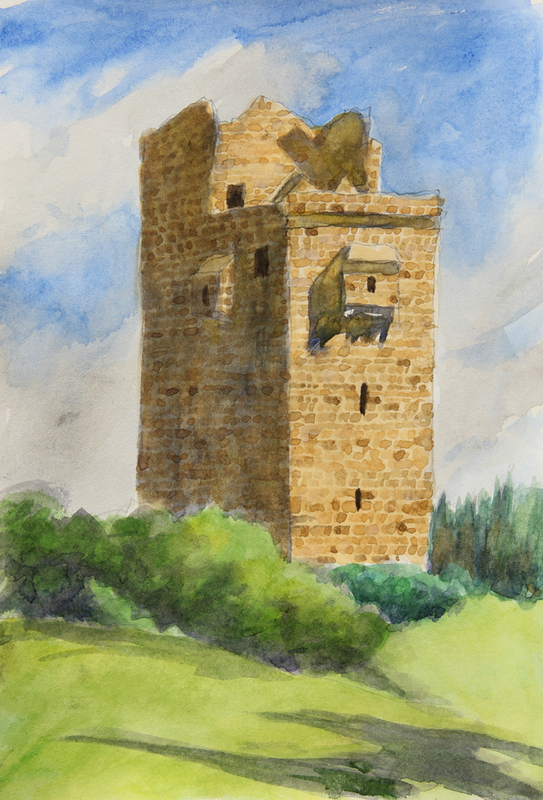 Ballanacky Castle, watercolor on paper 10" x 8"